This tour takes you for a tour through history , from the Mayan temples of Copan in Honduras to the hidden ruins in the jungle of Tikal in Guatemala and Caracol in Belize. We tour around the lake Atitlan, one of the most beautiful lakes of the world surrounded by three impressive volcanoes. 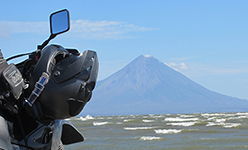 The Nicaragua and El Savador scenery of the Pacific is marked by an impressive chain of 27 volcanoes. Some of these volcanoes are still active with spectacular eruptions. Most of these volcanoes have an easy access and if we ride up, our efforts will be rewarded by the unforgettable and breathtaking view at the top. 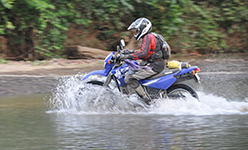 The Panamerican Highway (CA1) will be our main road from Honduras through Nicaragua to Costa Rica. 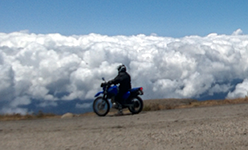 On our way we pass majestic volcanoes, colonial towns, ride on a dirt roads to picturesque beaches at the Pacific Ocean and come across the highest point of the Panamerican Road in Central America known as the “cerro de la muerto” at 3000 m above sea level. Central America is a destination where the attractions of ancient ruined cities compete with the dense, evergreen rainforest of the jungle. 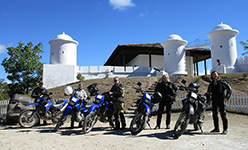 Take a ride through the exotic countryside of 4 countries (Belize, Guatemala, El Salvador, Honduras, Nicaragua) exploring colonial and Mayan culture, volcanoes, Caribbean and Pacific beaches and jungle trails.